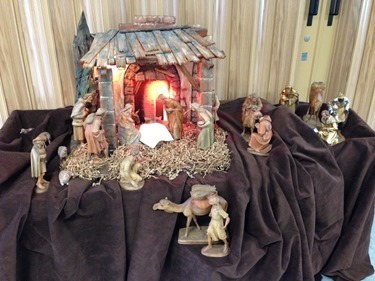 Because of the way Christmas falls and it being such a busy time with Masses and visits, I have decided to post my blog a little bit earlier than normal this week. Rest assured, I will share all of my Christmas activities with you in my next week’s post. 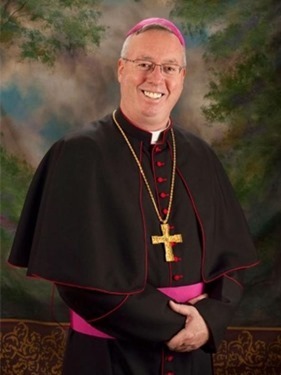 After a long wait, I am sure the people of Vermont were very excited to learn this past week that the Holy Father is sending them a new bishop, one certainly well known to the priests and people of Boston, Bishop Christopher Coyne. Bishop Coyne, of course, was a priest of the Archdiocese of Boston who went on to become an auxiliary bishop and administrator of the Archdiocese of Indianapolis. He is now returning to New England and I know the people of the Diocese of Burlington will be happy to be getting a bishop who knows how to ski! We give thanks to our Holy Father, Pope Francis, for having named the Most Rev. 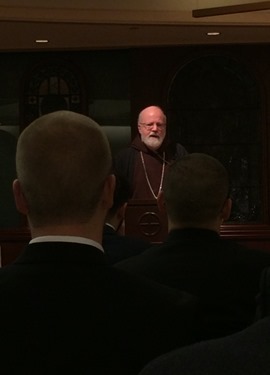 Christopher Coyne as bishop-elect of the Diocese of Burlington, Vermont. The Archdiocese of Boston joins the faithful of the Diocese of Burlington in congratulating Bishop Coyne, a son of the Archdiocese and ordained to the priesthood here almost thirty years ago, and assuring him of our prayers as he prepares to begin this new leadership role. The Catholic Church throughout New England will benefit from Bishop Coyne’s pastoral concern for the people of God and his contributions to our shared efforts to carry out the mission entrusted to us by the Lord. 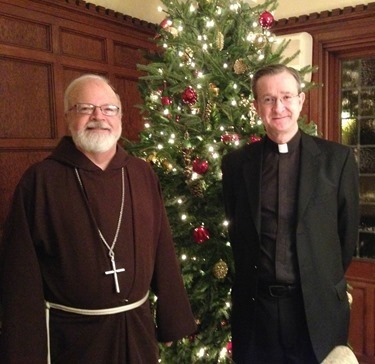 Thursday evening I was visited by Father Tom Bohlin, the head of Opus Dei in the United States. His sister, Karen, is the headmistress of the Montrose School in Medfield and he usually visits me once a year to update me on some of their activities and initiatives. 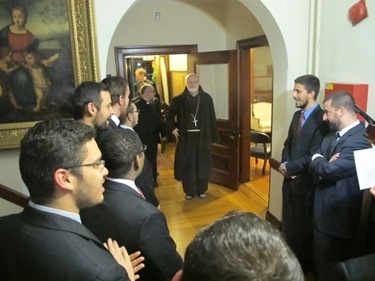 Certainly, the Opus Dei has a very important presence in our archdiocese, particularly with the young people at the universities, as well as at their retreat house, Arnold Hall in Pembroke. 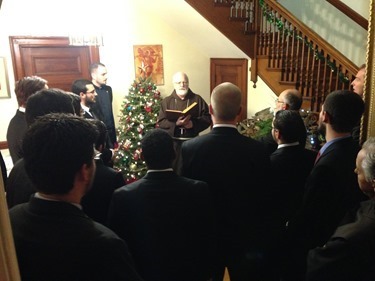 On Friday went for an Advent visit to our Redemptoris Mater Seminary in Brookline. 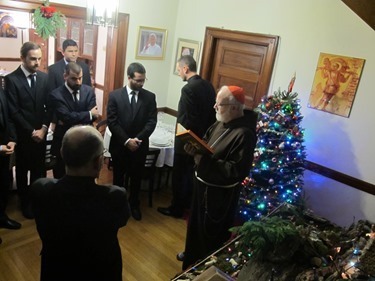 We began with Vespers, followed by the blessing of the Crèche. Afterwards, we had a lovely meal and sang Christmas carols together. 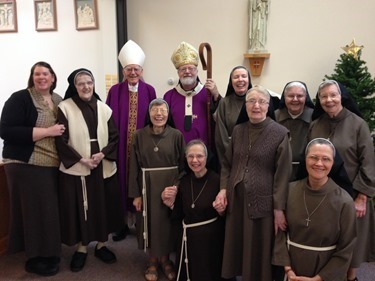 At the beginning of this Year of Consecrated Life, I was very pleased to be able to visit the Poor Clares in Andover on the last Sunday of Advent. Sister Therese Marie and the sisters were wonderful hosts for our Mass and lunch together. 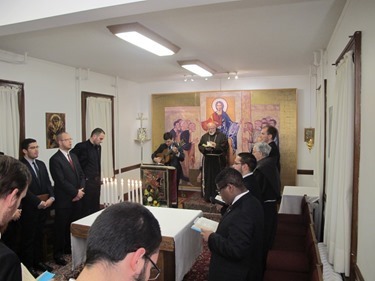 It was also nice to see their new postulant. I am so happy that the community is getting a new vocation. 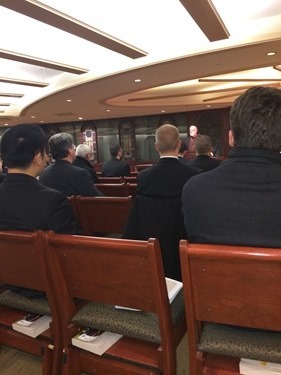 That afternoon, I gathered with all our seminarians – from St. John’s, Redemptoris Mater, Pope St. John XXIII and Our Lady of Providence — at the Pastoral Center for evening prayer. 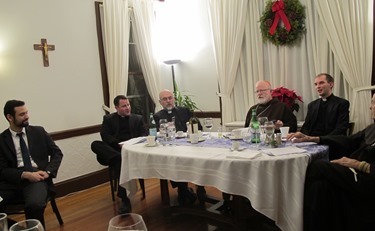 Afterwards, we had a very nice meal and sang Christmas carols together. 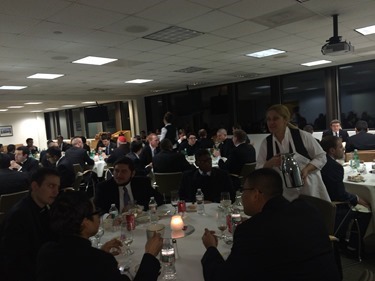 We are always happy to have this type of opportunity to bring together the seminarians who are studying in different places. The only ones who were not able to be with us were those studying in Rome. All of us have recollections of Christmases past and I was recently approached by Tom Farragher of the Boston Globe who asked me about my recollections of former Christmases. 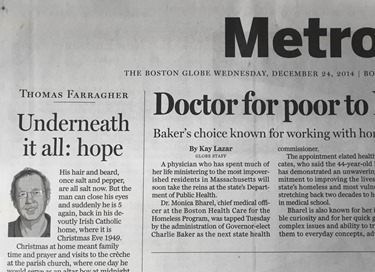 Out of that conversation, he distilled the column, “Underneath it all: hope,” which appeared in the Globe’s Metro section today. I thought it was a very nice column for Christmas Eve, and you can find it here. Finally, I want to leave you with my Christmas message, which I released earlier today. Christmas is the feast of God’s love for us. Our God loves us so much that he wants to be close to us. 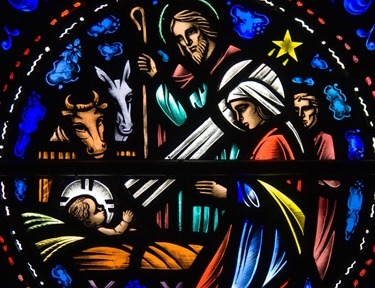 He wants to insert himself into our hearts as he comes at Bethlehem to manifest his love in the face of a little child, because God’s love is always new, always fresh, never tires of forgiving us, never tires of calling us to friendship, never tires of loving us. Like the shepherds, we must share this joy and the good news with others. We are called to be disciples who are missionaries, who joyfully proclaim the good news of Jesus’ Gospel: that our God is with us, our God is forgiving us, our God is calling us to friendship and discipleship. That is the treasure and the great gift of Christmas that all of us must share with those around us.